London, March 18: British Prime Minister Theresa May is making a last-minute push to win support for her European Union divorce deal, with attention focused on wooing Northern Ireland's Democratic Unionist Party. The DUP's 10 lawmakers are pivotal to May's effort to overturn two overwhelming defeats in Parliament, because their support could influence hard-line members of May's Conservative Party. Opposition has focused on the so-called backstop, designed to ensure there is no hard border between Northern Ireland and the Republic of Ireland. Theresa May Urged by Members of Conservative Party to Secure Brexit Concessions. 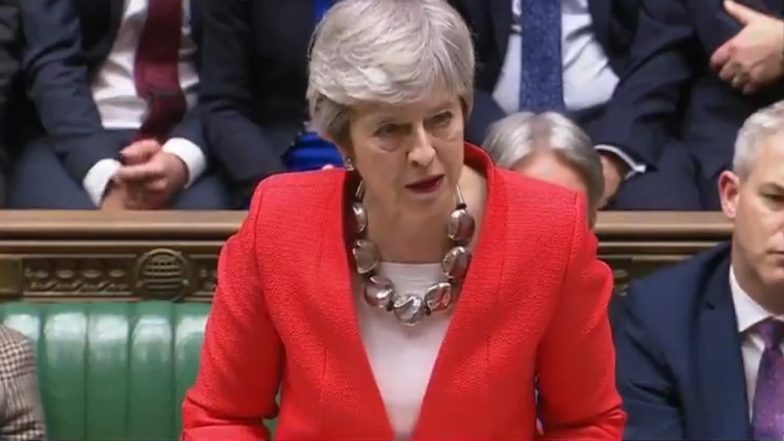 But May suffered a setback Monday when former Foreign Secretary Boris Johnson refused to support her deal. Johnson used his column in the Daily Telegraph to say that further changes are needed to the backstop, claiming it left the U.K. vulnerable to "an indefinite means of blackmail" by Brussels.